Browse: Home /	Community Building, ENERGY SOLUTIONS, LIVABLE STREETS, Renewable Energy / Solar PowerBike needs your help! 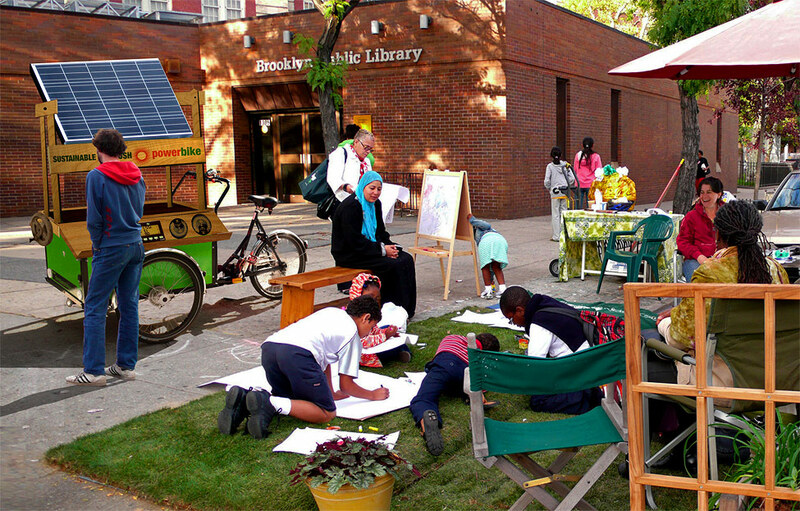 Help us win a grant to build this Solar PowerBike for the Flatbush community! Sustainable Flatbush has entered a proposal in National Geographic’s Green Effect environmental grant contest. Winners receive funding to create “green” projects that help their local environment and community. 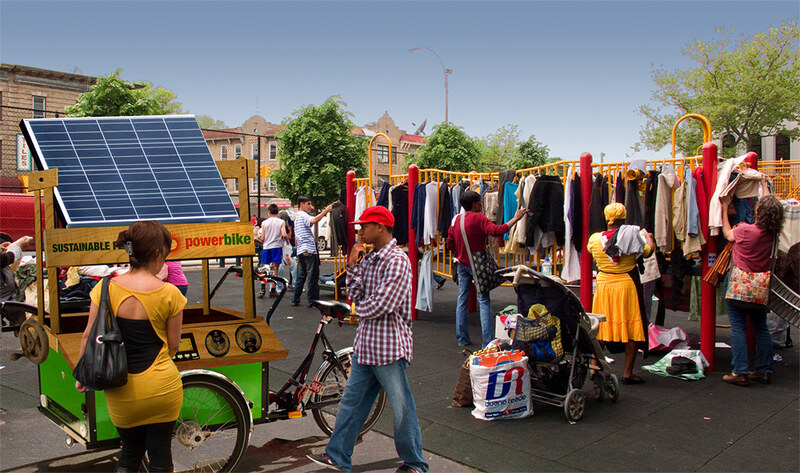 Help us win so we can build the PowerBike mobile solar energy station here in Flatbush! WE NEED YOU to visit the website, rate our proposal, and leave a comment! Your ratings and comments give us a better chance of being selected as one of the 10 finalists. Sustainable Flatbush off-grid solar PowerBike! Turn the crank to point it toward the sun! An education station makes the PowerBike ideal for teaching school kids about energy and the environment. Through appealing readouts and data-collection software, students monitor system performance like power output and avoided greenhouse gas emissions. The residents of Flatbush, Brooklyn are showing what we can do on the neighborhood level to reduce our carbon footprint, fight global warming, and foster community at the same time. This project is a long-term investment in local renewable energy for our community. Day after day, year after year, the neighborhood PowerBike keeps harnessing clean power, keeps teaching the skills that are the foundation of our new green economy, and keeps modeling a way of life that does not jeopardize future generations. 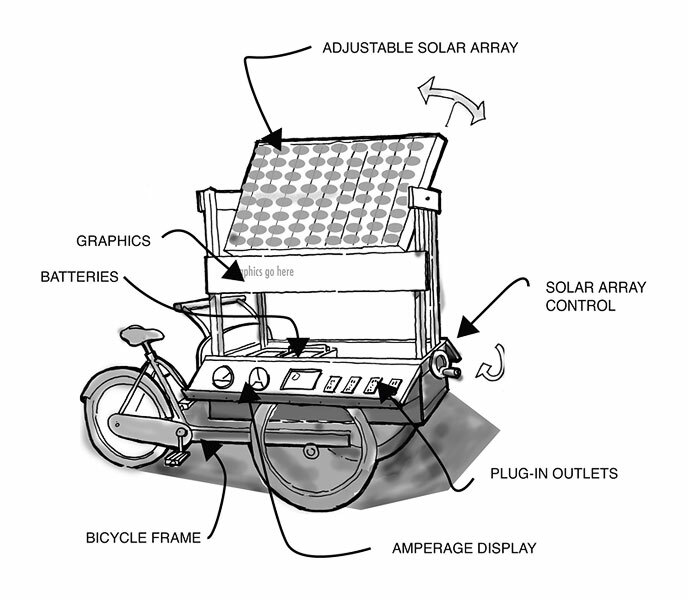 This solar bike design looks fantastic.Why don’t you use a 180watts mono solar panel? It looks really cool. I wish solar powered technology on a small scale were more common. I live in New York City and have never seen a solar panel here. We definitely do have solar panels in New York City (someone should map them all)! The largest installation I know of is on the roof of the Stillwell Avenue/Coney Island subway station. Anyone want to name some others? how about the battery bank design?how much time it could be last work?